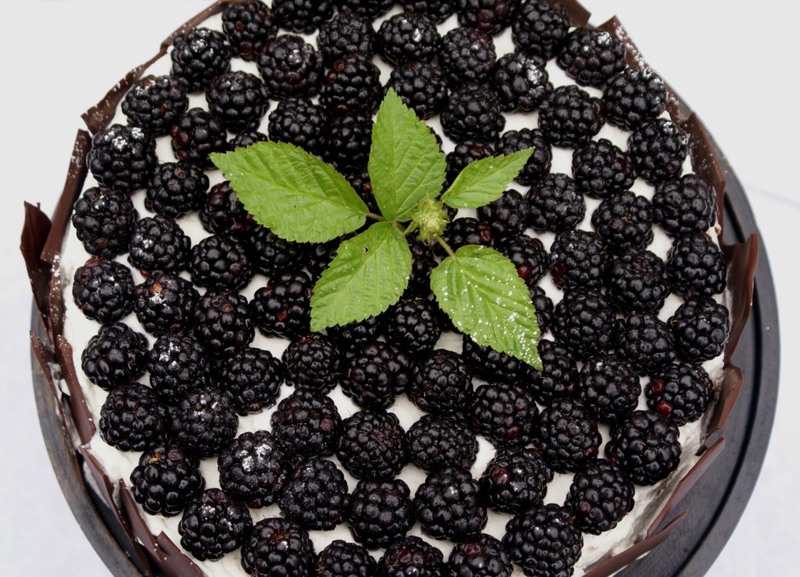 As she has a beautifully distinguished character, so her wish for a birthday cake was a bit unusual as well: A Blackberry Cake. Birthday blackberry cake was certainly a challenge, but it turned out super delicious! Divide eggs. Beat egg whites with 3 tbsp water until foamy. Slowly add sugar and vanilla, mix for couple of minutes, then add one by one egg yolk. Combine flour, corn starch and baking powder. Gently fold into egg mixture. Pour the batter into a 9 inch (23 cm) spring form cake pan lined with parchment paper. Bake at 365 F (185 C) 20 – 30 minutes. Cool completely and then slice through into two equal pieces. Heat 3/4 cup (125 ml) cream in a 1-quart heavy saucepan until hot. Whisk together yolks, sugar, and a pinch of salt in a metal bowl until combined well, then add hot cream in a slow stream, whisking until combined. Transfer mixture to saucepan and cook over moderately low heat, stirring constantly, until it registers 160°F (71 C)on thermometer. Pour custard through a fine-mesh sieve into a bowl and stir in vanilla. Melt chocolate in a metal bowl set over a pan of simmering water stirring frequently. Whisk custard into chocolate until smooth, then cool. Beat remaining 1 1/4 (375 ml)cups cream in a bowl with an electric mixer until it just holds stiff peaks. Whisk one fourth of cream into chocolate custard to lighten, then fold in remaining cream gently but thoroughly. Place the bottom cake part back into the spring form. 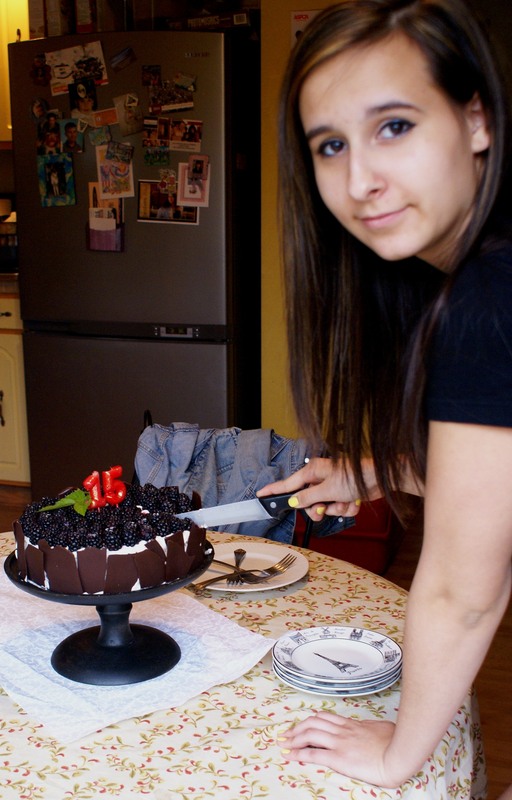 Pour the chocolate mousse onto the cake. Cover and leave it in the fridge for at least 4 hours. 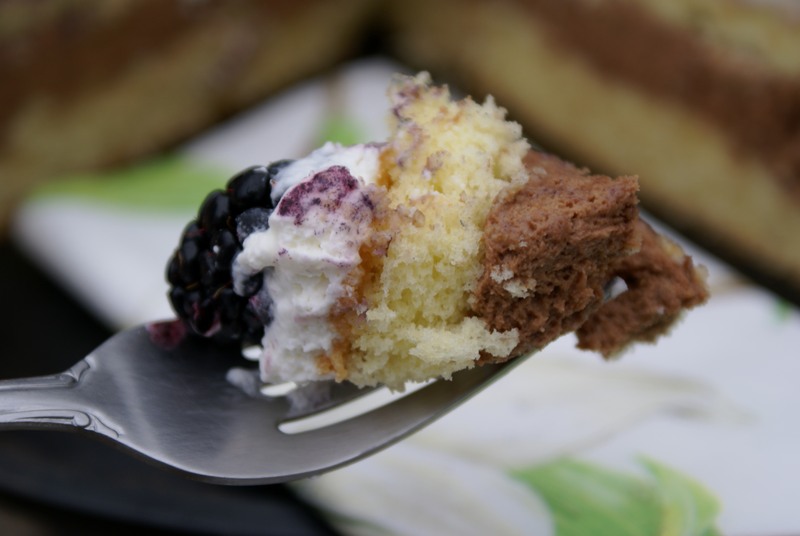 Do not put top cake piece over the mousse as it is still very soft. Cover with plastic wrap and save it until ready to ensemble the cake. Whip heavy cream until firm, add sugar and vanilla. Cover and leave in the fridge until ready to ansamble the cake. Melt the chocolate in a metal bowl placed over a pot of simmering water. Spread the melted chocolate in two thin ribbons on piece of parchment paper, place it in the freezer. Make sure each ribbon is at least 3 inches (7-8 cm) high. Wash blackberries and place them on a kitchen towel to dry. Remove the spring form with mousse from the fridge. If the mousse is firm enough, place the second sponge cake on the top. 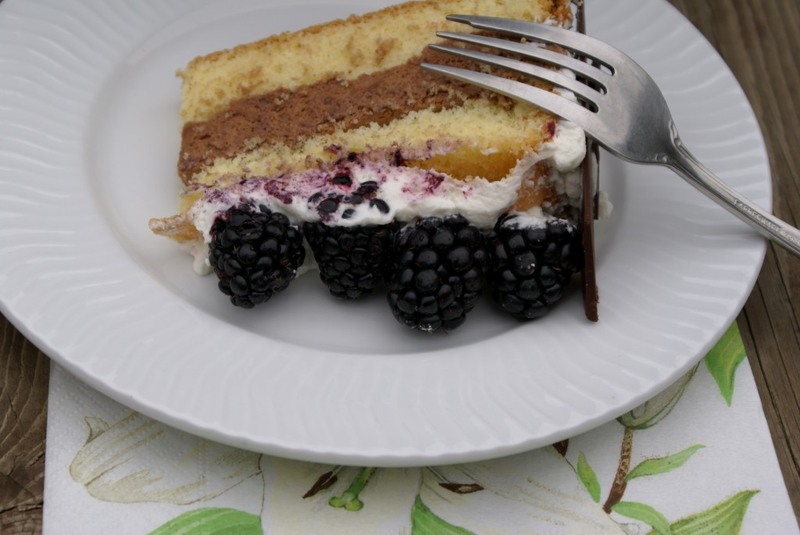 Remove the cake from the spring form and place it onto a serving plate. Frost the cake all around with whipped cream. Remove the chocolate ribbons from the freezer. Break them up into 1 – 2 inch pieces. Make sure pieces are little higher than the cake. Place the pieces around the cake to form a „fence“. 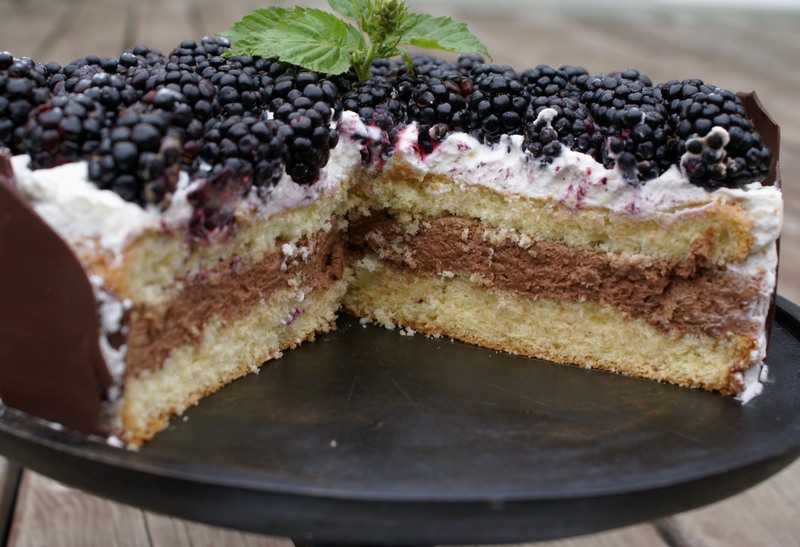 Place the blackberries on the top of the cake. 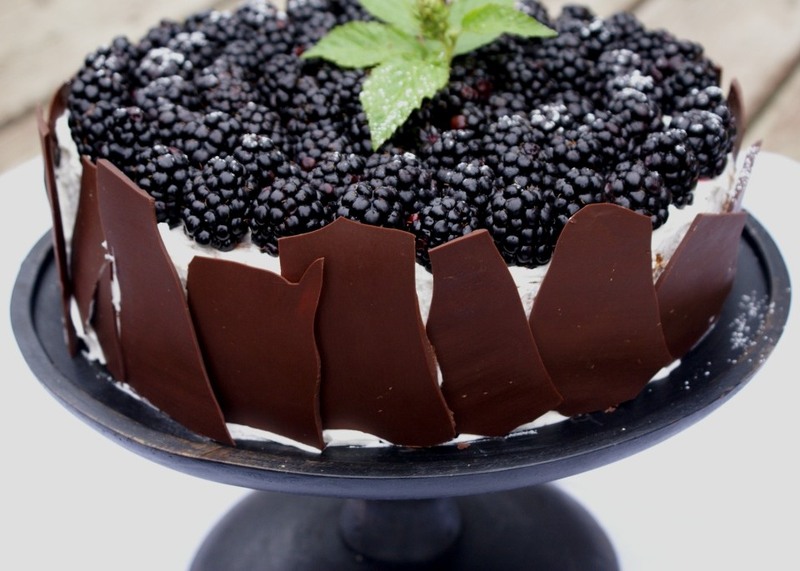 If desired, dust with powder sugar and decorate with blackberry leaves. What a lovely cake! I love blackberries too. Happy birthday to your daughter! Thank you Sara! 🙂 Thanks for stopping by! Love the blackberries! Beautiful cake and beautiful daughter! That cake is a work of art! If you put that much work into a cake, I can just imagine how much mothering you gave and are giving to your daughter! Sorry to hear that your Mom passed early. I just lost my Mom a few weeks ago. It’s very hard, but I was lucky to have her in my life for many years. Your daughter is so beautiful!! Happy Birthday!! I think your cake has to be the prettiest I’ve seen in a long while, I love the large shards of chocolate along the sides and the pretty pattern of berries on top!! well done, that cake is stunning. A very happy 15th to your baby girl. She is a sweet heart. I am sure that your chocolate mousse raspberry cake put that smile on her face. Yet another amazing cake! Best wishes for your daughter! That looks absolutely beautiful. Yum. What size springform pan did you use, Sibella? What a lovely cake AND a lovely daughter! Thank so much! 🙂 I used 9 inch (23 cm) spring form. I forgot to add that to the recipe. I will go back and update. Have a great Sunday! That looks fantastic! I am going to put organic blackberries on my shopping list so I make one. Thank you! 🙂 If you make it, please let me know how it turned out for you..
What ann over-the-top beautiful cake – and what a lucky young lady! Happy Birthday to her. Awwwww, thanks so much! My daughter looks just like me when I was her age! 🙂 She loved her cake! I had this idea in my head for a while and I was so happy that it turned out so good and delicious. Thanks for stopping by!